Adaptation: Mahou Shoujo nante Mou Ii desukara. Prequel: Mahou Shoujo Nante Mou Ii Desukara. As second seasons should be (IMO), "Mahou Shoujo Nante Mou Ii Desukara. 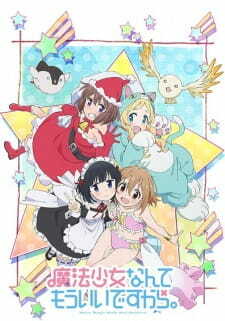 2nd Season" is so similar to the first one that both seems to be just a split of the same season separated by 6 months. So, here's a suggestion for those who have watched the first season, but not the second one yet: if you liked it, watch this; if you disliked, don't watch. Quite simple, huh? I mean, since these seasons are so alike, you shouldn't bother to watch something you don't like, even if it's just around 48 (12x4) minutes [by the way, I think it's better to watch one episode per day or something like this than watching it all in one go, it's a short to be "tasted" not devoured]. Slice of life, comedy, and magic, everything was maintained/kept. Yuzuka's father is still a real workaholic (work-addicted), Miton is going to be even more over-punished/abused (mostly by Chiya). Mafuyu's grandpa, a crazy gamer and probably the funniest character, shows up. There are more Dia (Daiya) appearances and explanations about her. There are only little changes: Yuzuka was more "childish" and had a more high-pitched voice (like 2 years younger, but I don't know if she has really aged) and used to be more embarrassed by Miton's "harassment". The first season was a bit more cute and a bit less funny. Some episodes are specially aimed at the Japanese audience, so you might miss a joke (for example, the episode about Japanese writing) or get the wrong idea sometimes (there's a satirical episode about overwork, which is very common in Japan, that some people didn't understand very well). Any comment (especially grammatical or structural comments) about this review will be greatly appreciated.